Over 300 recorded archaeological sites in Kruger Park attest to its occupation before modern times. Most sites however had relatively short occupation periods, as the presence of predators and the tsetse fly limited cattle husbandry. 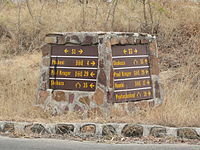 At Masorini hill, beside the H9 route, iron smelting was practiced up to the Mfecane era. The reconstructed Thulamela on a hilltop south of the Levuvhu River was occupied from the 13th to 16th centuries, and had links with traders from the African east coast. Before the Second Anglo-Boer War the area now covered by the park was a remote section of the eastern Transvaal's last wild frontier. Paul Kruger, President of the South African Republic at the time, proclaimed the area, which was inhabited by the Tsonga people, a sanctuary for the protection of its wildlife. James Stevenson Hamilton noted many kraals along the Sabi River and also further north beyond the Letaba River although the north was sparsely populated compared to the south. Many of the local natives were employed by railway companies for construction of rail connections, notably that between Pretoria and Lorenço Marques during the end of the 19th century. Abel Chapman, one of the hunters who noted that the area was over-hunted by the end of the 19th century, brought this fact to wider attention. In 1895, Jakob Louis van Wyk introduced in the Volksraad of the old South African Republic a motion to create the game reserve. The area proposed extended from the Crocodile River to the Sabi River in the north. That motion, introduced together with another Volksraad member by the name of R. K. Loveday, and accepted for discussion in September 1895 by a majority of one vote, resulted in the proclamation by Paul Kruger, president of the Transvaal Republic (South African Republic), on 26 March 1898, of a "Government Wildlife Park." This park would later be known as the Sabi Game Reserve. The park was initially created to control hunting and to protect the diminished number of animals in the park. James Stevenson-Hamilton became the first warden of the reserve in 1902. The reserve was located in the southern one-third of the modern park. 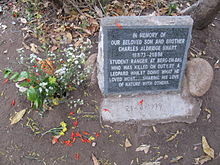 Singwitsi Reserve, named after the Shingwedzi River and now in northern Kruger National Park, was proclaimed in 1903. During the following decades all the native tribes were removed from the reserve and during the 1960s the last were removed at Makuleke in the Pafuri triangle. In 1926, Sabie Game Reserve, the adjacent Shingwedzi Game Reserve, and farms were combined to create Kruger National Park. During 1923, the first large groups of tourists started visiting the Sabie Game Reserve, but only as part of the South African Railways' popular "Round in Nine" tours. The tourist trains used the Selati railway line between Komatipoort on the Mozambican border and Tzaneen in Limpopo Province. The tour included an overnight stop at Sabie Bridge (now Skukuza) and a short walk, escorted by armed rangers, into the bush. It soon became a highlight of the tour and it gave valuable support for the campaign to proclaim the Sabie Game Reserve as a national park. Warden James Stevenson-Hamilton retired on 30 April 1946, after 44 years as warden of the Kruger Park and its predecessor, the Sabi Sabi Game Reserve. Plaque in the park. Now and then people do get killed, however, this is extremely rare. Stevenson-Hamilton was replaced by Colonel J. A. B. Sandenbergh of the South African Air Force. During 1959, work commenced to completely fence the park boundaries. Work started on the southern boundary along the Crocodile River and in 1960 the western and northern boundaries were fenced, followed by the eastern boundary with Mozambique. The purpose of the fence was to curb the spread of diseases, facilitate border patrolling and inhibit the movement of poachers. 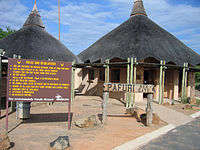 In 1996 the Makuleke tribe submitted a land claim for 19,842 hectares (198.42 km2), namely the Pafuri or Makuleke region in the northernmost part of the park. The land was given back to the Makuleke people, however, they chose not to resettle on the land but to engage with the private sector to invest in tourism. This resulted in the building of several game lodges from which they earn royalties. In the late 1990s, the fences between the Kruger Park and Klaserie Game Reserve, Olifants Game Reserve and Balule Game Reserve were dropped and incorporated into the Greater Kruger Park with 400,000 hectares added to the Reserve. In 2002, Kruger National Park, Gonarezhou National Park in Zimbabwe, and Limpopo National Park in Mozambique were incorporated into a peace park, the Great Limpopo Transfrontier Park. In 2009, SANParks envisaged a four-star hotel northeast of Malelane on the bank of the Crocodile River, as part of a survival strategy to make the park less dependent on state subsidies. Eventually Radisson Blu was mandated to operate a 104 room safari resort starting 2019, which promises a smaller ecological footprint than that of prior, existing camps. The three-star, 128-room Skukuza Safari Lodge, to be completed by late 2018, was necessitated by the adjacent Nombolo Mdhluli conference center, opened in 2011, which draws guests arriving by charter flights or in tour busses. Former head of the park Salomon Joubert warned that these developments threaten the character, ethos and original objectives of the park, but minister of environmental affairs, Edna Molewa, deemed development of 0.3% of the park as acceptable. 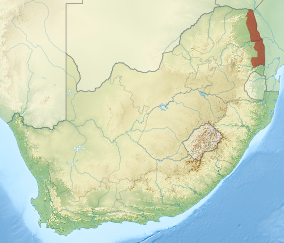 The park lies in the north-east of South Africa, in the eastern parts of Limpopo and Mpumalanga provinces. Phalaborwa, Limpopo is the only town in South Africa that borders the Kruger National Park. It is one of the largest national parks in the world, with an area of 19,485 square kilometres (7,523 sq mi). The park is approximately 360 kilometres (220 mi) long, and has an average width of 65 kilometres (40 mi). At its widest point, the park is 90 kilometres (56 mi) wide from east to west. To the north and south of the park two rivers, the Limpopo and the Crocodile respectively, act as its natural boundaries. To the east the Lebombo Mountains separate it from Mozambique. Its western boundary runs parallel with this range, roughly 65 kilometres (40 mi) distant. The park varies in altitude between 200 metres (660 ft) in the east and 840 metres (2,760 ft) in the south-west near Berg-en-Dal. The highest point in the park is here, a hill called Khandzalive. Several rivers run through the park from west to east, including the Sabie, Olifants, Crocodile, Letaba, Luvuvhu and Limpopo Rivers. The climate of the Kruger National Park and Lowveld is subtropical. Summer days are humid and hot. The rainy season is from September until May. The Kruger National Park website lists September and October as the driest periods, culminating in rains late in October. This area lies between the western boundary and roughly the centre of the park south of the Olifants River. Combretums, such as the red bush-willow (Combretum apiculatum), and Acacia species predominate while there are a great number of marula trees (Sclerocarya caffra). The Acacias are dominant along the rivers and streams, the very dense Nwatimhiri bush along the Sabie River between Skukuza and Lower Sabie being a very good example. South of the Olifants River in the eastern half of the park, this area provides the most important grazing-land. Species such as red grass (Themeda triandra) and buffalo grass (Panicum maximum) predominate while the knob-thorn (Acacia nigrescens), leadwood (Combretum imberbe) and marula (Sclerocarya caffra) are the main tree species. This area lies in the western half of the park, north of the Olifants River. The two most prominent species here are the red bush-willow (Combretum apiculatum) and the mopane tree (Colophospermum mopane). Shrub mopane covers almost the entire north-eastern part of the park. There are a number of smaller areas in the park which carry distinctive vegetation such as Pretoriuskop where the sickle bush and the silver cluster-leaf (Terminalia sericea) are prominent. The sandveld communities near Punda Maria are equally definitive, with a wide variety of unique species. 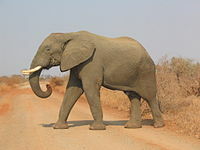 Elephant crossing a road. A photoshopped version of this photo was used as an April Fool's prank in 2018. All the big five game animals are found at Kruger National Park, which has more species of large mammals than any other African game reserve (at 147 species). There are webcams set up to observe the wildlife. The park stopped culling elephants in 1994 and tried translocating them, but by 2004 the population had increased to 11,670 elephants, by 2006 to approximately 13,500, by 2009 to 11,672, and by 2012 to 16,900. The park's habitats may only be able to sustain about 8,000 elephants, though this is not entirely clear. Elephants do change plant growth and density in the park, and some species, such as wildebeests, clearly benefit from an increase in grasslands. The park started an attempt at using contraception in 1995, but has stopped that due to problems with delivering the contraceptives and upsetting the herds. Kruger supports packs of the endangered African wild dog, of which there are thought to be only about 400 in the whole of South Africa. Out of the 517 species of birds found at Kruger, 253 are residents, 117 non-breeding migrants, and 147 nomads. Some of the larger birds require large territories or are sensitive to habitat degradation. Six of these species, which are by and large restricted to Kruger and other extensive conservation areas, have been assigned to a fanciful grouping called the "Big Six Birds". They are the lappet-faced vulture, martial eagle, saddle-billed stork, kori bustard, ground hornbill and the reclusive Pel's fishing owl, which is localized and seldom seen. There are between 25 and 30 breeding pairs of saddle-billed storks in the park, besides a handful of non-breeding individuals. In 2012 178 family groups of ground hornbills roamed the park and 78 nests were known, of which 50% were active. 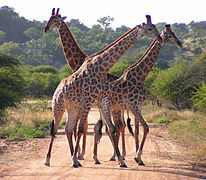 Kruger is inhabited by 114 species of reptile, including black mamba, african rock pythons, and 3,000 crocodiles. Thirty-three species of amphibians are found in the Park, as well as 50 fish species. A Zambesi shark, Carcharhinus leucas, also known as the bull shark, was caught at the confluence of the Limpopo and Luvuvhu Rivers in July 1950. Zambezi sharks tolerate fresh water and can travel far up rivers like the Limpopo. 219 species of butterfly and skipper are native to the park. The fastest and most robust of these belong to genus Charaxes, of which 12 species have been recorded. Genera Papilio and Acraea are also well-represented, with about 10 and 15 species respectively. The total number of Lepidoptera species in the park is unknown, but could be in the order of 7,000, many of which range widely in African savanna. The mopane moth in the northern half of the park is one of the best known, and communities outside the park have at times been given permits to harvest their caterpillars. The park has a high diversity of termites and 22 genera are known to occur, including the mound-building genera Macrotermes, Cubitermes, Amitermes, Odontotermes and Trinervitermes. Many species of mosquito occur in the park, including the Culex, Aedes and Anopheles genera which target mammals. A. arabiensis is the most prevalent of the 9 or more Anopheles species in the park, and their females transmit malaria. As of 2018, 350 species of arachnids, excluding ticks and mites, are known from Kruger. These are mostly true spiders, including 7 species of baboon spider, but also 9 scorpion species, 7 pseudoscorpion species, and 18 solifugid species (sun and roman spiders), 2 species of harvestmen and 1 species of tailless whip scorpion. Kruger is not exempt from the threat of poaching that many other African countries have faced. Many poachers are in search of ivory from elephant tusks or rhino horns, which are similar in composition to human fingernails. The park's anti-poaching unit consists of 650 SANParks game rangers, assisted by the SAPS and the SANDF (including the SAAF). As of 2013, the park is equipped with two drones borrowed from Denel and two Aérospatiale Gazelle helicopters, donated by the RAF to augment its air space presence. Automated movement sensors relay intrusions along the Mozambique border to a control center, and a specialist dog unit has been introduced. Buffer zones have been established along the border with Mozambique, from where many poachers have infiltrated the park, as an alternative to costly new fences. The original 150 km long fences were dropped in 2002 to establish the Great Limpopo Transfrontier Park. The national anti-poaching committee oversees all activities and coordinates interested parties. Kruger's big game poachers operate with night vision instruments and large caliber rifles, fitted with suppressors and sophisticated telescopic sights. They are mostly Mozambique citizens that initiate their carefully planned incursions from the border region of South Africa and Mozambique. In 2012 some 200 poachers were apprehended, while about 30 were killed in skirmishes. In July 2012, a Kruger game ranger and policeman were the first to die in an anti-poaching operation, while other employees reported intimidation by poachers. A Kruger personnel strike affected some anti-poaching operations, and some employees have been directly implicated. Rangers in and around the park have been pressured or blackmailed by poaching syndicates to provide intelligence on the whereabouts of rhinos and anti-poaching operations. In December 2012, Kruger started using a Seeker II drone against rhino poachers. The drone was loaned to the South African National Parks authority by its manufacturer Denel Dynamics, South Africa. In February 2018, the head of a suspected poacher was found in the Kruger Park near Hoedspruit, his body dragged off and eaten by lions, it is assumed. Officials suspected it to be the head of a park employee who went missing days before, but it became clear that the man was, in fact, a suspected poacher when the park employee was found alive. The head was found in an area frequented by lions, along with a loaded hunting rifle. Poachers make no distinction between white and black rhinos, but losses of black rhinos are low due to their reclusive and aggressive nature. Rhino horn fetches between $66,000 and $82,000 per kilogram, and the CITES ban has proved largely ineffectual against the trade in rhino horn. The second horn is sometimes also hacked from the skull to obtain about 100 ml of moisture that is sold locally as traditional medicine. Poaching rhino horn escalated in the 21st century, with 949 rhinos killed in Kruger in the first 12 years, and more than 520 in 2013 alone. A memorandum of agreement is seen as a necessary milestone in stemming the tide between South Africa and Vietnam, in addition to the one with China, while negotiations have not yet started with Thailand. The amount of rhino horn held in storage is not publicly known. Since 2009, some Kruger rhinos have been fitted with invisible tracing devices in their bodies and horns which enable officials to locate their carcasses and to track the smuggled horns by satellite. South Africa's 22,000 white and black rhinos represent some 93% of these species' world population, 12,000 of which are found in Kruger. 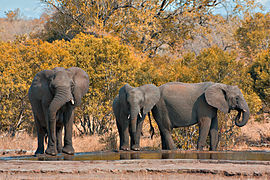 Kruger experienced significant elephant poaching in the 1980s, which has since abated. It holds over 48 tons of ivory in storage. According to Convention on the International Trade in Endangered Species of Wild Flora and Fauna (CITES), it is allowed to sell 30 tons. Following approval by CITES, 47 metric tons of stockpiled ivory from Kruger was auctioned on 6 November 2008. The sale fetched approximately US$6.7 million which was allocated to increased anti-poaching measures. The average price for the 63 lots on auction was US$142/kg. It is foreseen that the placement of wire traps to procure meat would eventually become the most challenging form of poaching. A scheme has been proposed to reward adjacent communities with the proceeds of game sales in return for their cooperation in game preservation. The larger communities include Bosbokrand, Acornhoek, Hazyview, Hoedspruit, Komatipoort, Malelane, Marloth Park, Nelspruit and Phalaborwa. Nine different trails are on offer in the Kruger National Park. Some are overnight and they last several days in areas of wilderness virtually untouched by humans. There are no set trails in the wilderness areas; a visitor walks along paths made by animals or seeks out new routes through the bush. ^ Rob East, ed. (1989). "Chapter 10: South Africa". Antelopes: Southern and South-Central Africa Pt. 2: Global Survey and Regional Action Plans. International Union for Conservation of Nature and Natural Resources, roughly the Size of Wales. Antelope Specialist Group. p. 60. ISBN 978-2-88032-970-9. ^ Merriam Webster's Collegiate Encyclopedia. Merriam-Webster. January 2001. p. 902. ISBN 978-0-87779-017-4. ^ "The Official SADC Trade, Industry and Investment Review 2006" (PDF). Southern African Development Community. 2006. p. 217. Retrieved 23 July 2011. ^ House of Assembly Debates, cols 4366-81, 31 May 1927. ^ a b Stevenson-Hamilton, James. (1937). South African Eden: The Kruger National Park 1902-1946. Struik Publishers, 1993. ^ Stevenson-Hamilton, James (1939). South African Eden. London. 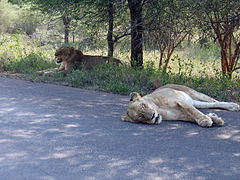 ^ a b Kruger National Park Archived 31 October 2008 at the Wayback Machine, Lonely Planet, page 467. ^ a b c d Foxcroft, Llewellyn C.; Richardson, DM; Wilson, JR (2008). "Ornamental Plants as Invasive Aliens: Problems and Solutions in Kruger National Park, South Africa". Environmental Management. 41 (1): 32–51. doi:10.1007/s00267-007-9027-9. PMID 17943344. ^ McNeely, Jeffrey A., International Union for Conservation of Nature and Natural Resources, 2001, The Great Reshuffling, IUCN, ISBN 2-8317-0602-5. ^ a b c Kruger National Park Archived 31 October 2008 at the Wayback Machine, Lonely Planet, page 468. ^ a b c Bulpin, T.V., Treasury of Travel Series: Kruger National Park, Creda Press, 1974. ^ Pienaar, U. de V., Neem uit die Verlede, Sigma Pers, 1990. ^ Steenkamp, C. (2000). "The Makuleke Land Claim" (PDF). IIED Evaluating Eden Programme. Archived from the original (PDF) on 22 July 2011. ^ Kruger National Park (2007). "Kruger History". Retrieved 4 August 2007. ^ "COMMISSION ON THE RESTITUTION OF LAND RIGHTS MEDIA STATEMENT ON A CLAIM BY THE MAKULEKE TRIBE ON A PORTION OF THE KRUGER NATIONAL PARK AND OTHER AREAS". South African Commission on Restitution of Land Rights. 6 August 1996. Archived from the original on 4 June 2011. Retrieved 9 December 2009. ^ Siyabona Africa (2007). "Pafuri Camp". Kruger Park. Archived from the original on 14 February 2007. ^ Siyabona Africa (2007). "Outpost". Kruger Park. ^ a b Viljoen, Buks (4 March 2011). "Duur hotels 'sal einde van Krugerpark wees'". Beeld. ^ "RADISSON BLU SAFARI RESORT KRUGER NATIONAL PARK" (PDF). www.sanparks.org. Retrieved 23 July 2018. ^ "Radisson Blu Safari Resort Kruger Park". south-african-lodges.com. Retrieved 23 July 2018. ^ a b c Lombard Steyn, Louzel (21 February 2017). "New R269.5m Skukuza Safari Lodge to open in Kruger in 2018". traveller24.com. Retrieved 23 July 2018. ^ "Climate data for Skukuza". South African Weather Service. Archived from the original on 23 August 2011. Retrieved 7 March 2010. ^ Wasserman, Helena (2018). "SA's biggest ever April Fool's joke reached 20 million people worldwide". The Business Insider. Retrieved 30 May 2018. 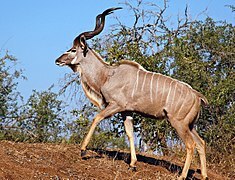 ^ "Kruger Statistics & Animal Numbers » Big 5, Kruger National Park » Dreamfields Guesthouse". dreamfieldsguesthouse.com. Retrieved 5 October 2017. ^ "Response from SANParks to Misleading Reports and Claims about Rhino Sales and Hunting in National Parks". 15 July 2009. Archived from the original on 21 January 2010. Retrieved 16 October 2009. ^ a b Engelbrecht, Derek. "Kruger National Park's Big 6 Birds". Birders. Sanparks. Retrieved 9 January 2013. ^ Jackson, Neels (27 December 2012). "Wildtuin help sy bromvoëls só". Beeld. Archived from the original on 16 May 2013. Retrieved 9 January 2013. ^ Williams, Mark C. "Checklist of the butterflies and skippers of the Kruger National Park" (PDF). sanparks.org. Retrieved 20 November 2018. ^ Otto, Herbert. "Butterflies of the KNP". krugerpark.co.za. Retrieved 19 January 2019. ^ a b Kloppers, Johan; Van Son, G. (1978). Butterflies of the Kruger National Park. Pretoria: Board of Curators for National Parks. pp. 79–84. ISBN 0-86953-021-6. ^ "Mopane Worm Harvest". krugerpark.co.za. Retrieved 21 January 2019. ^ Maota, Ray (20 December 2010). "Mopane worms to alleviate hunger". brandsouthafrica.com. Retrieved 21 January 2019. ^ Masuku, Dumisile (17 December 2012). "Mopani worms harvested in KNP". News24. Retrieved 21 January 2019. ^ Meyer, Victor W.; Braack, L.E.O. ; Biggs, H.C.; Ebersohn, Colleen (March 1999). "Distribution and density of termite mounds in the northern Kruger National Park, with specific reference to those constructed by Macrotermes Holmgren (Isoptera: Termitidae)". African Entomology. 7 (1): 123–130. Retrieved 20 November 2018. ^ Munhenga, Givemore; Brooke, Basil D; Spillings, Belinda; Essop, Leyya; Hunt, Richard H; Midzi, Stephen; Govender, Danny; Braack, Leo; Koekemoer, Lizette L (2014). "Field study site selection, species abundance and monthly distribution of anopheline mosquitoes in the northern Kruger National Park, South Africa". Malaria Journal. 13 (1): 27. doi:10.1186/1475-2875-13-27. Retrieved 21 January 2019. ^ "Elephant Poachers Take Aim at South Africa's Famed Refuge". 13 November 2015. Retrieved 23 February 2018. ^ a b "Kruger-heining terug? : Regering wil renosterstropers só uit wildtuin hou". Beeld. 17 January 2012. Archived from the original on 16 May 2013. Retrieved 25 January 2013. ^ a b Viljoen, Buks (14 December 2012). "Stropers: R100 000 vir inligting". Beeld. Archived from the original on 16 May 2013. Retrieved 25 January 2013. ^ Tempelhoff, Elise (7 November 2012). "Oë in die lug teen park se stropers". Beeld. Archived from the original on 16 May 2013. Retrieved 25 January 2013. ^ Tempelhoff, Elise (11 November 2012). "'Wildtuin is slagveld'". Beeld. Archived from the original on 16 May 2013. Retrieved 25 January 2013. ^ Viljoen, Buks (24 October 2012). "Honde deel van stryd teen stropers". Beeld. Archived from the original on 16 May 2013. Retrieved 25 January 2013. ^ Tempelhoff, Elise (26 June 2012). "Kruger: Staat sê ja vir 2 buffers: Sones sal ook help om stropery te keer". Beeld. Archived from the original on 16 May 2013. Retrieved 25 January 2013. ^ a b Tempelhoff, Elise (30 March 2012). "Nee vir draad tussen wildtuin, buurland". Beeld. Archived from the original on 16 May 2013. Retrieved 25 January 2013. ^ "Heining kan skans bied teen stropers". Beeld. 18 January 2012. Archived from the original on 16 May 2013. Retrieved 25 January 2013. ^ Jani Meyer, Jani Meyer (25 September 2012). "Dragtige koei, nog 7 renosters gestroop". Beeld. Archived from the original on 16 May 2013. Retrieved 25 January 2013. ^ Tempelhoff, Elise (27 June 2012). "Stropery: Minister moet bedank, eis groep". Beeld. Archived from the original on 16 May 2013. Retrieved 25 January 2013. ^ a b Buks Viljoen, Buks Viljoen (15 February 2012). "Stropers raak ál beter, meer waaghalsig". Beeld. Archived from the original on 16 May 2013. Retrieved 25 January 2013. ^ Tempelhoff, Elise (22 December 2012). "Stropers slaan veral híér toe: Gebied van SANParke loop meeste deur". Volksblad. Archived from the original on 29 April 2015. Retrieved 27 August 2013. ^ Viljoen, Buks (29 November 2012). "SANW gryp báie meer aan grens". Beeld. Archived from the original on 16 May 2013. Retrieved 25 January 2013. ^ a b Viljoen, Buks (12 January 2011). "5 renosterstropers in Krugerwildtuin doodgeskiet". Beeld. Archived from the original on 16 May 2013. Retrieved 25 January 2013. ^ Tempelhoff, Elise (1 November 2012). "Twee doodgeskiet wat glo wil stroop". Beeld. Archived from the original on 16 May 2013. Retrieved 25 January 2013. ^ Viljoen, Buks (13 January 2012). "2 stropers doodgeskiet". Beeld. Archived from the original on 19 February 2013. Retrieved 25 January 2013. ^ Tempelhoff, Elise (9 October 2012). "Stroper geskiet in wildtuin, 1 gewond". Beeld. Archived from the original on 16 May 2013. Retrieved 25 January 2013. ^ Tempelhoff, Elise (25 July 2012). "Skietery in Kruger eis twee: Wildtuin is 'n 'oorlogsone'". Beeld. Archived from the original on 16 May 2013. Retrieved 25 January 2013. ^ a b Viljoen, Buks (28 March 2012). "'Verkeerslid help met stropery': Hof hoor hoe vier beplan". Beeld. Archived from the original on 16 May 2013. Retrieved 25 January 2013. ^ a b c South Africa's 18,780 white and 1,916 black rhinos were still increasing in 2012, see: Otto, Hanti (5 April 2012). "Minister is 'optimisties' oor stropery". Beeld. Archived from the original on 16 May 2013. Retrieved 25 January 2013. ^ a b Viljoen, Buks (5 April 2012). "Veldwag met dood gedreig in 4 se saak". Beeld. Archived from the original on 16 May 2013. Retrieved 25 January 2013. ^ Viljoen, Buks (14 April 2012). "Horings: Vroue vas oor hulle dreig". Beeld. Archived from the original on 16 May 2013. Retrieved 25 January 2013. ^ Viljoen, Buks (9 February 2012). "Afgetredes ingeroep om te help in wildtuin". Beeld. Archived from the original on 16 May 2013. Retrieved 25 January 2013. ^ Viljoen, Buks (1 March 2012). "Vier van Kruger vas oor stropery: Voertuie uitgesnuffel". Beeld. Archived from the original on 19 February 2013. Retrieved 25 January 2013. ^ Viljoen, Buks (2 March 2012). "Vier bly in Skukuza-selle". Beeld. Archived from the original on 16 May 2013. Retrieved 25 January 2013. ^ Viljoen, Buks, Jody Nel (27 July 2011). "Wildtuin-veldwagter vas weens renosterstropery". Beeld. Archived from the original on 16 May 2013. Retrieved 25 January 2013. ^ Viljoen, Buks (5 December 2006). "Húlle slaan nié bokke dood, sê drie van wildtuin". Beeld. Archived from the original on 16 May 2013. Retrieved 25 January 2013. ^ Citizen reporter (16 January 2019). "Three Kruger Park rangers arrested for alleged rhino poaching". Environment. The Citizen. Retrieved 17 January 2019. ^ Groenewald, Yolandi (23 August 2016). "Poaching syndicates target Kruger rangers". Oxpeckers. Retrieved 25 August 2016. ^ Schlesinger, Fay (16 March 2013). "Animal activists to use drones in fight against illegal hunting". The Times. p. 17. Retrieved 22 August 2016. ^ Otto, Hanti (25 April 2012). "Hy kyk renoster in oë". Beeld. Archived from the original on 16 May 2013. Retrieved 25 January 2013. ^ a b c Viljoen, Buks (4 December 2012). "Toeriste kry gestroopte swartrenoster in Kruger". Beeld. Archived from the original on 16 May 2013. Retrieved 25 January 2013. ^ "Hoeders van die horing". Beeld. 19 May 2012. Archived from the original on 16 May 2013. Retrieved 25 January 2013. ^ Tempelhoff, Elise (23 August 2013). "Kommentaar en ontleding: Stroop vir terreur-geld". Beeld. Retrieved 27 August 2013. ^ Tempelhoff, Elise (13 June 2012). "245 renosters al vanjaar gestroop; 161 in arres". Beeld. Archived from the original on 16 May 2013. Retrieved 25 January 2013. ^ a b c Cilliers, Susan (13 August 2012). "5 gestroop in één park: Nuwe plan nodig vir renosters, sê kenners". Beeld. Archived from the original on 16 May 2013. Retrieved 25 January 2013. ^ "4 rhino poachers killed, 17 arrested in Kruger Park". City Press. SAPA. 23 November 2013. Archived from the original on 27 November 2013. Retrieved 27 November 2013. ^ More than 476 Kruger rhinos poached in 2013. See: De Sakutin, Stephane (25 October 2013). "Over 100 rhinos poached in S.Africa in past month". Yahoo! News, South Africa. Retrieved 29 October 2013. ^ "SA, Viëtnam teken gou oor renosters". Beeld. 23 October 2012. Archived from the original on 16 May 2013. Retrieved 25 January 2013. ^ Zwecker, Wolfram (11 November 2012). "Hof waarsku smokkelaars met vonnis: 'Bly weg uit SA!'". Beeld. Archived from the original on 16 May 2013. Retrieved 25 January 2013. ^ Elise Tempelhoff, Elise Tempelhoff (9 April 2012). "Interpol se hulp ingeroep teen renosterstropery". Beeld. Archived from the original on 16 May 2013. Retrieved 25 January 2013. ^ Tempelhoff, Elise (30 March 2012). "Nee vir draad tussen wildtuin, buurland". Beeld. Archived from the original on 16 May 2013. Retrieved 25 January 2013. ^ a b Coetzee, Cobus (28 November 2009). "'Aanslag' op renosters in Krugerwildtuin se visier: Elektroniese skyfies in lyf en horings ingespan teen wilddiefstal". Beeld. Archived from the original on 16 May 2013. Retrieved 25 January 2013. ^ a b Swart, Magda (13 November 2012). "Radikale reddingsplan". Beeld. Archived from the original on 16 May 2013. Retrieved 25 January 2013.